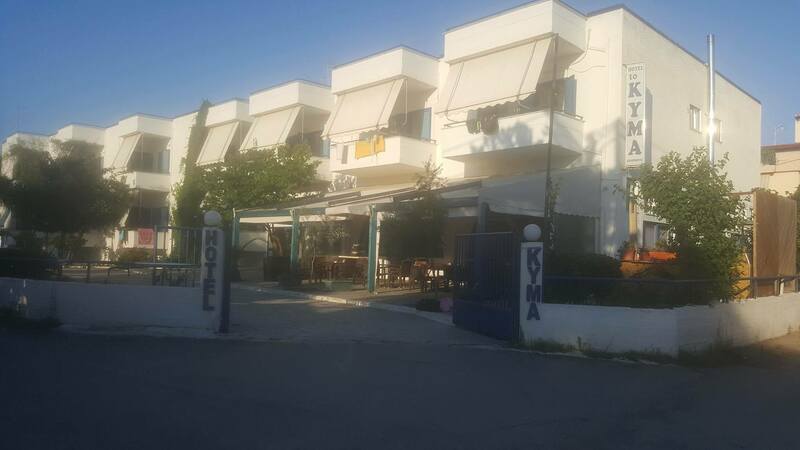 The hotel “KYMA” is located in one of the most advantageous areas in central Euboea, next to Eretria.It is in the beautiful seaside town Amarynthos,which makes it easy for our guests to go on daily trips to historical places of the surrounding region,as well as to more distant places in Central Greece and Attika – Viotia area. Tourists from all over Greece as well as foreign tourists who wish to spend peaceful and inexpensive family holidays can find us next to the sunny beach of Euboean sea. Our hotel is a family business which was founded years ago with taste and keeps on having as priority the perfect stay for the guest who needs relaxing and care free holidays. The owners with love go on upgrading their work and manage to combine the traditional type of accommodation with all the modern facilities. That way our guests can enjoy relaxing holidays without losing touch with the fast rhythms of everyday life. Pets are allowed without charge. There is free parking space in our garden. On the ground floor there is a restaurant where you can enjoy traditional Greek dishes as well as any special menus that you need. If you wish you can have your meal in a food package and enjoy it anywhere you want.